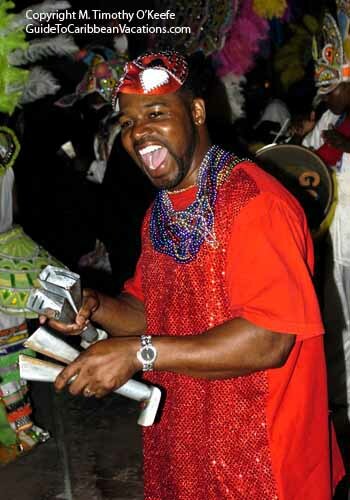 Cowbells are one of Junkanoo's signature sounds. And although many Bahamians wear elaborate costumes made from cardboard, wire, styrofoam and paper mache, others prefer something simpler, like this reveler. But always with color! Visitors to the island are welcome to join in. Nassau, Cable Beach and Paradise Island hotels all can make arrangements for guests to join Junkanoo.